I have trees throughout my neighborhood that function as friends. There, I’ve said it. As I am writing this I am leaning against a huge oak. It’s an old, wise, giving tree in a park within walking distance from my house. I make it my business to visit this tree regularly. I have a feeling that different trees provide us with different medicines just as plants do. In my experience, we don’t even have to create anything from trees to receive their healing benefits. We can just sit with them and have positive shifts in our energy or receive insights. Trees have allowed me to experience this older form of healing. Every time I sit with one, I come away changed. This oak I’m with always surrounds me with an energy of support long after I leave the park. It reminds me that I can only grow when I nourish and nurture my roots. It helps me be unabashed in my love for nature–even when I am alone, I have no issue walking up to the tree to lean on it or even give it a hug. 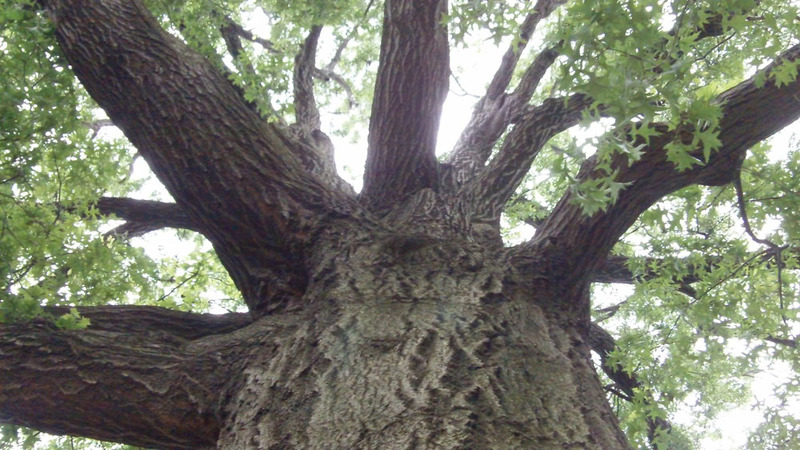 My friend the oak says that there is a time for everything: from quiet growth to abundant sharing. As the leaves fall and change color this Autumn, please don’t forget to sit and listen to the wisdom of the trees and plants. What has nature told you lately? Ekere, I love your post on Oak and remember to relate to trees on a regularly. I miss the towering oaks of New York but getting to know the scrub and gambel oaks of the southwest. Very astringent medicine..made scrub oak bark into a powder and used it on my face a bit. It may serve as a good tooth powder too. Sat beneath an alligator juniper here; never would have thought to do this previously but it shifted my entire awareness. This is wonderful. We have allies everywhere. There is medicine everywhere. The possibilities for tapping into Mother Nature’s beauty are endless. I am so glad to hear about how you are living this. I enjoyed your article and do share an appreciation for trees. There are a number of trees in the yard near my window. I often stop to admire them while seated at my desk. They always have visitors; squirrels, birds and insects. Trees have always been a place of peace where I sit to read, write or just enjoy my surroundings. Yes, I have hugged trees. However, I will remember to hug them more frequently. Greetings. I also love writing and relaxing by trees. There is something deeply centering about being around them. I look forward to hearing about what happens when you embrace more of them. This is fantastic! Thank you so much for this. At times I have envisioned plants that I feel close with to feel the calming affects of them, but I have never envisioned them for physical healing. What a wonderful teaching. Ashe to you! Great info, ever give workshops in the Houston area? ?